Collinsville School Superintendent Pat Herald, Middle School Principal Kelly Hamlin, and Collinsville Chamber President Larry Shafer presented the majority of the information at the Chamber's meeting Thursday (Feb. 5th). The February 24th ($4.1 Million) School Bond Election was the main topic of the meeting. 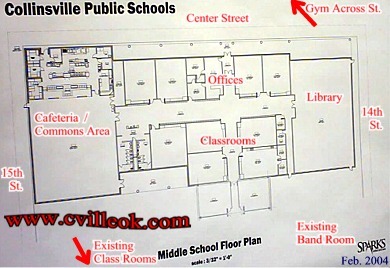 The plans above show the proposed layout of the new building at the middle school campus. This building would replace the existing Media Center and Cafeteria buildings on the north end of the block. There will also be 6 new classrooms added at the high school and a list of other improvements on other campuses. The Chamber membership drive will be held later this month. Ballots were collected at this meeting for the Chamber's Board of Directors. Billie Francis will be the new secretary / treasurer freeing up Robin Bell. Progress continues on restoring the pressed metal ceiling in the Chamber's future office. Brad Overhold collected his Gold Key award announced at the Chamber Banquet. The Chamber voted to draft a resolution in support of the School Bond Election.